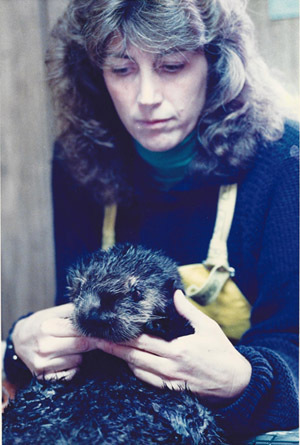 Terrie Williams in 1989 with 'Fred Jr.,' the first oiled sea otter treated by her team after the Exxon Valdez oil spill. The oil spill killed nearly 3,000 sea otters, including Fred Jr.
Twenty-five years ago, on March 24, 1989, the oil tanker Exxon Valdez ran aground off the coast of Alaska, eventually spilling 11 million gallons of crude oil into the pristine waters of Prince William Sound. The environmental impacts of the Exxon Valdez oil spill were profound, affecting 1,300 miles of rugged Alaskan coastline. The short-term effects alone included the deaths of 2,800 sea otters, hundreds of seals, unknown numbers of salmon, and hundreds of thousands of seabirds. Biologist Terrie Williams was on the front lines of the disaster, directing sea otter rescue efforts. For Williams, now a professor of ecology and evolutionary biology at UC Santa Cruz, the Exxon Valdez oil spill marked a turning point. She said the experience made her realize she could not simply focus on her research and let others do conservation. "I realized that each individual has to take part in the conservation effort for it to work," she said. "I also saw that the people who were most effective in dealing with this environmental disaster and its effects on wildlife were the scientists who had expertise with the animals and knowledge of how they lived in their environment." Williams is an expert in animal physiology and energetics who has studied a wide range of marine mammals, including sea otters, dolphins, whales, and seals. During and after the Exxon Valdez oil spill, she directed the Valdez Sea Otter Rescue Center and coordinated a scientific research team to assess the effects of crude oil on marine birds and mammals. Williams subsequently co-edited and wrote several chapters of the book Emergency Care and Rehabilitation of Oiled Sea Otters, now the standard reference on the topic. She has also served as a scientific advisor for California's Oiled Wildlife Care Network. Each year for the past 25 years following the spill, Williams and her Exxon Valdez colleagues have traveled to Alaska to train a new generation of oiled wildlife responders, using the lessons gleaned from the earlier oil spill. "The most important lesson from the 1989 spill was one of preparedness," she said. "In 1989 there was no oiled wildlife plan, no veterinary expertise or even the soap to clean the otters. Today we have equipment and a dedicated, educated team of experts poised to respond to the inevitable oil spill. Like any emergency crew, we are on call 24/7. For the oiled wildlife, it will mean the difference between suffering or life." Williams came to UCSC in 1993 as a marine research physiologist in the Institute of Marine Sciences and joined the biology faculty as an assistant professor in 1994. In 2000, she was the first faculty member appointed to the Ida Benson Lynn Endowed Chair in Ocean Health at UCSC.